Issue #061 - March, 2018. A Tribute To Those Who Keep Us Free. 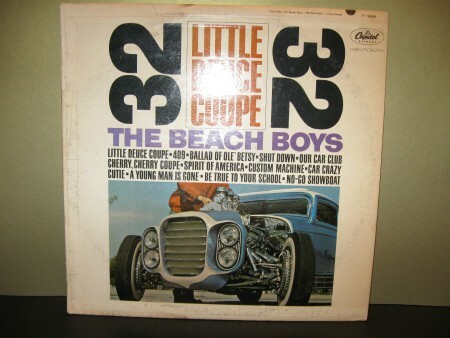 Album Art of The Month - Little Deuce Coupe. Favorite Cover Songs of past 50 years. The Beau Dollar & The Coins "Soul Serenade" page is nearing completion. I have been in contact with the original members of the band and the history behind the recording of the song. It should be noted that this particular cover of the original King Curtis song may not be familiar to many outside the Hamilton-Cincinnati area. It was not a nationwide hit back in the 60's but I firmly believe that once you read the story and hear this version of the song you too may wonder, why not! Meet The Reflections. 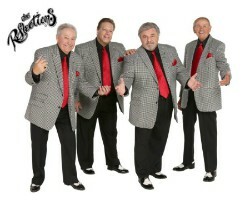 Received a nice email from Gary Banovet, a member of the Doo-Wop group, The Reflections (Just Like) Romeo & Juliet. Gary enjoyed our Doo-Wop page and glad to see we are keeping the oldies alive. He said the group is still touring nationwide with their original lead singer, Tony Micale. Thank you for the kind words Gary. I contacted my DJ friend, Ned Ward, and requested the song for his Monday show (03-26-2018). Ned played the 1964 hit song request (twice) and gave a nice "shout out" to Gary and the group. Ned plays the song regularly on his show. Check out the group on YouTube. They have some great videos. If you would like to book the group you can contact The Reflections here. "I am a part of the American Flag. I have flown over a home in the U.S.A. I can no longer fly. The sun and the wind have caused me to be tattered and torn. Please carry me as a reminder that you are not forgotten." I sent the "star" along with the note to my Marine grandson, Michael, who is currently serving in Afghanistan. 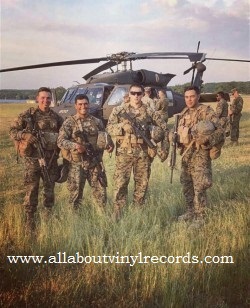 The photo was taken during training in the US prior to Michael's (far right) shipment to Afghanistan in 2017. If you purchase a flag, buy it from the American Legion. It helps support military families in your community. American Legion flags are 100% made in the USA. A Birthday Remembered and A Sad Loss. 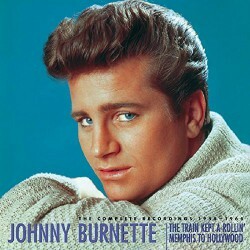 Remembering Johnny Burnette, born March 25, 1934, in Memphis, Tennessee. His two biggest songs that most remember are "Dreamin'" and "You're Sixteen," both recorded in 1960. Johnny died in a boating accident in 1964. The Burnette brothers enjoyed success as a songwriting team providing Ricky Nelson with hits "Believe What You Say," "It's Late," "Waiting in School" and "Just A Little Too Much." In 1956 Johnny recorded one of my favorites titled "Train Kept A-Rollin' and we have Rockabilly Queen, Imelda May singing the song with a mention of Johnny Burnette. Watch the Rockabilly lady here. 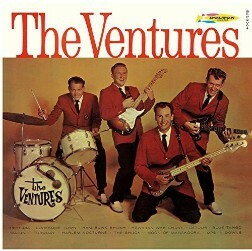 Nokie Edwards, a founding member of the Ventures who helped create those influential guitar hits in the 1960s for the guitar-driven band, including the surf-rock standard “Walk, Don’t Run,” died March 12 at a hospital in Yuma, Ariz. He was 82. Nokie Edwards is pictured 3rd from the left in this photo. 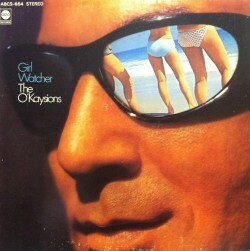 In 1968 a young group from North Carolina produced the standard "Girl Watcher," resulting in a top ten hit. Personnel included: lead singer Donnie Weaver, Ron Turner, Jim Spidel, Wayne Pittman, Jimmy Hennant, and Bruce Joyner. They began as the Kays, playing spiritual and country music. Many assumed The O'Kaysions were a black group, but all six of them, horn section and all, were white. No surprise being from the Carolinas where this song is considered a "Beach Shag" standard. Betcha didn't know the song "Girl Watcher" was recorded by Donnie as "Wheel Watcher," and used for several years as Vanna White's entrance music on Wheel of Fortune. For this months Album cover Art I have chosen a Beach Boys theme. 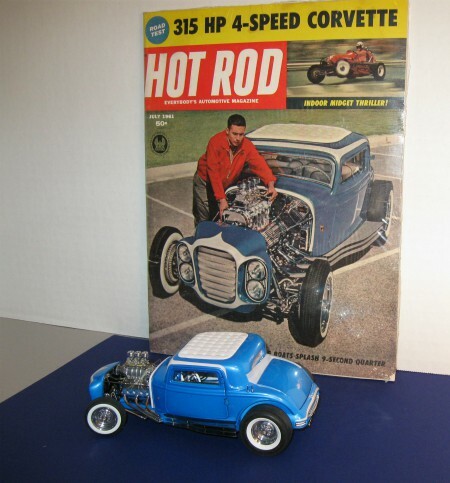 I'll share with you my original 1961 Hot Rod Magazine with the Little Deuce Coupe on the cover, and my personal Custom made limited edition '32 Ford coupe collectible from the Danbury Mint. I'll send this little masterpiece roaring straight from the Beach Boys' album cover into your Newsletter in box. Enjoy this Beach Boys trip back to a time I feel privileged to have lived in. The Little Deuce Coupe album was released in 1963, reached #4 in the US and remained on the charts for 46 weeks. 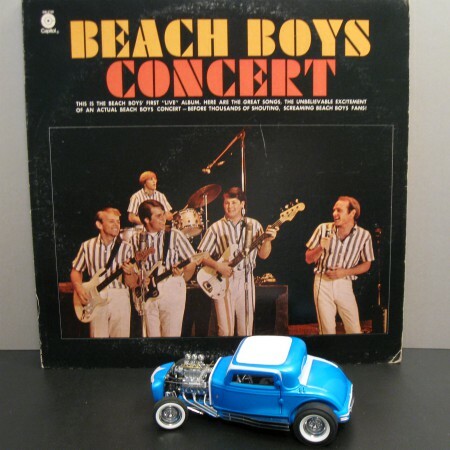 Beach Boys Concert is the first live album by the Beach Boys, released in 1964. I just add that Little Deuce Coupe with any Beach Boys album. The Hot Rod magazine is dated July, 1961 and the price was fifty cents. 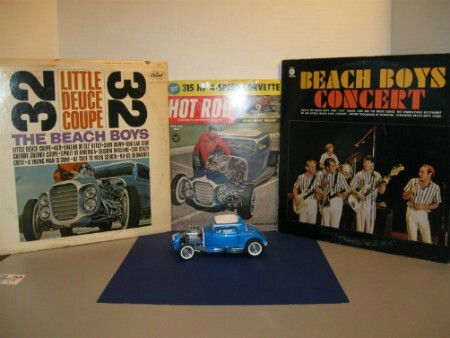 I purchased the magazine from a collector right after I received my Little Deuce Coupe. 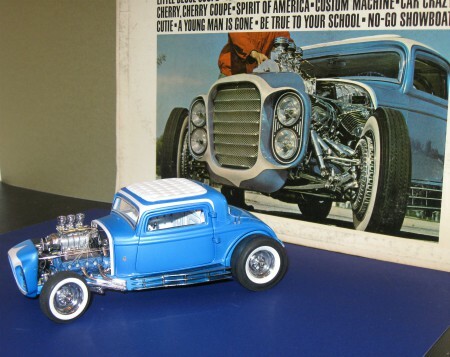 I purchased this Danbury mint Deuce Coupe, a 1:24 scale replica ten years ago in 2008. At the time the price was $140.00 plus shipping. You also received a title to your little masterpiece. Production was limited to the end of that same year, 2008. Visit my Little Deuce Coupe page and watch this storied classic come to life. 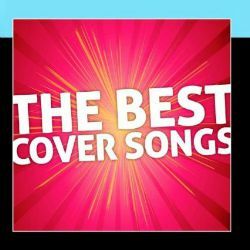 Best Cover Songs - Where The Best Version Isn't always the First Version. We've all been there. You hear a song, take it to heart and love it as your very own. Every note, every lyric is born from the talent of the artist or group singing that special song. And then comes the day you learn this special song you adore is actually something else...Yes, that song is just a cover song. It happens a lot more than you think. Here is my list of more than 20 songs that have been recorded as cover songs and are a different version of an original that are, in some ways, better than the original. Visit my Best Cover Songs page and see which ones are my favorite covers of the originals.